Let the MADNESS begin! Better yet, let All in WDW’s MAGIC madness begin! At 12:15 PM today, the NCAA will launch into 2014’s edition of its Men’s College Basketball Championship Tournament. Not to “one up” the NCAA, but here, and now, at 6:00 AM this morning, All in WDW presents its 2nd Annual Poll to “crown” an All in WDW Readers’ Favorite Magic Kingdom Attraction! This is THE 2014 “tourney”, folks! You know how it goes. This is Day #1 of Round 1. The “round of 78”! Can you believe it? 78?! The largest poll we’ve ever tackled! There are eight (8) groups below. Choose one (1) in each group. The Top 2 from each group will move forward into Round 2 – the round of 32! 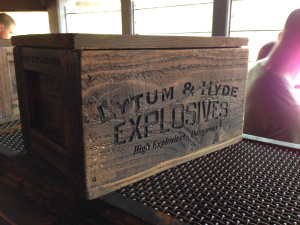 Where would you find this destructive little box?